An easy six markets model maker that helps make six markets model and charts with free templates. 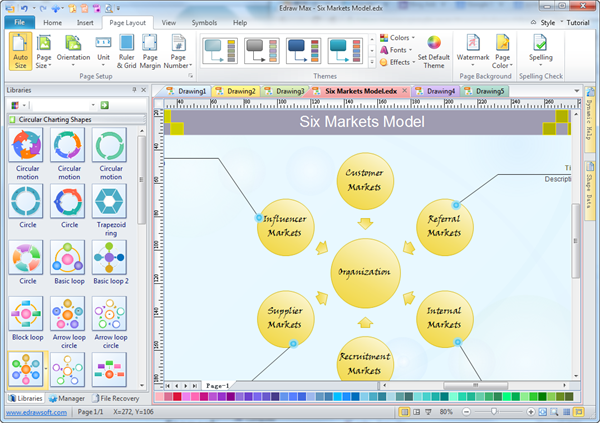 Quickly and easily create six markets model and many other diagram types in minutes. Discover why Edraw is an awesome six markets model maker: Download it Now. 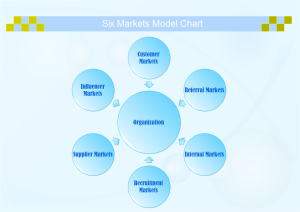 Edraw Six Markets Model maker is used to help visually represent reviewing the role of stakeholders. For those accustomed with other Microsoft apps such as Word or Excel, the interface will be very familiar. Simply drag and drop symbols, apply built-in designed themes, and share your finished six markets model into a presentation or PDF with one click automatically. Determine the level of concern and resources they should devote. 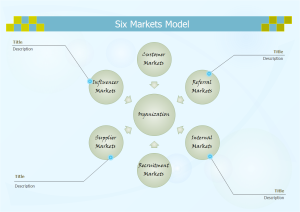 A six markets model example can help the organizers to study about the stakeholders and key market domain that may be important to them. Try this useful six markets model chart template which has eliminated the requirements of drawing skills to make creating a chart easy and rapid.